The first advantage of this recipe is that you can make and eat pizza in a moment you feel the craving for pizza. Another good part is that it does tastes yum as same as the store bought fancy pizzas. It votes to favor towards this recipe as we can control the cheese, the sauce, and the toppings. enough time or patience to preheat the oven. I never dreamt of achieving the same results without the oven, after the great lime chicken without the oven. There are tones of easy peasy breakfast recipes, this is small attempt to list some of them online. You can make exotic dishes even if you are left with few slices of bread and some vegetables in your refrigerator. Ingredients are not necessary to decide dull or energetic breakfast. It needs all the creative and energetic mind. 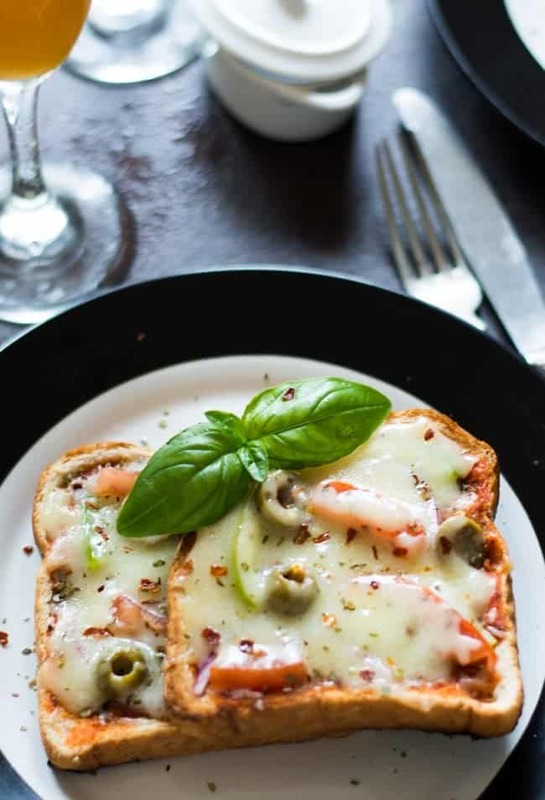 If you are healthy reduce the cheese and if you are not a spicy lover then decrease the amount sauce you spread on the bread. It is only you are deciding the food and customizing it accordingly. 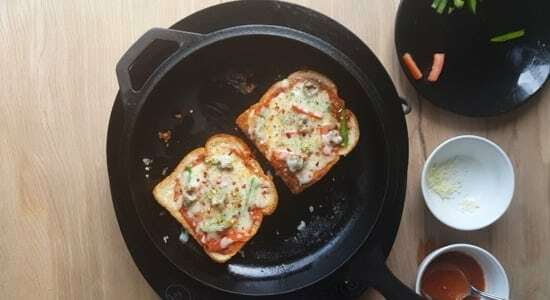 I made this bread pizza on the stove top for my son, so you are seeing cheesy toast. But if you see the next batch which I made for myself, you will barely see cheesy topping. But my version does also extremely good. But at times I make cheesy bites for myself whenever I feel down. And these few tiny treats are must for us to appreciate and motivate ourselves. We need properly closing lid to cover the pizza while cooking, though the oven does not need to make this melting cheesy bread pizza. The lid need not be fancy, yet should do the work properly. Mozzarella cheese is great but your favorite cheese will also work fine. 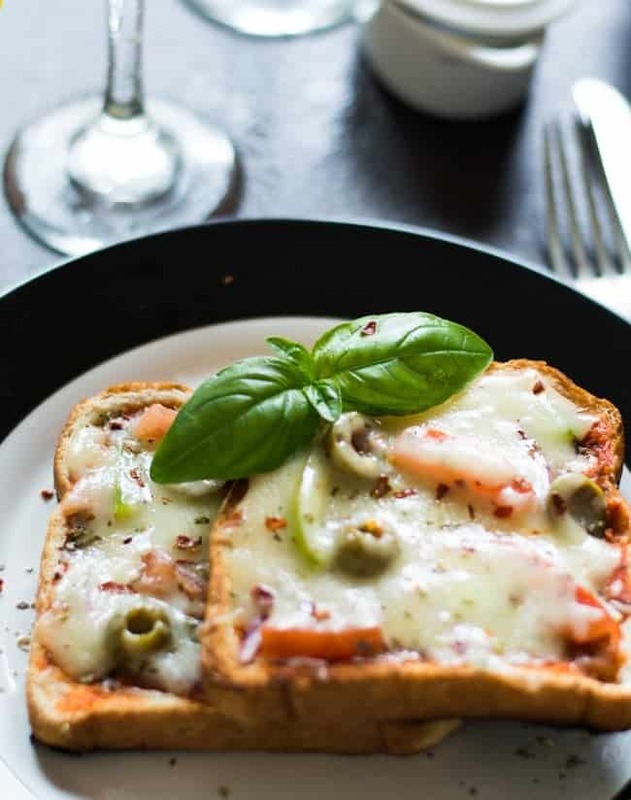 Green pepper, olives, tomatoes, onion, pickle, jalapeno, spinach or any other toppings will work fine in this recipe. Do not have these vegetable toppings, skip it and make your own version. But good pizza sauce is needed to make this perfect. Bring the cheese to the room temperature for better melting. And the lid that covers the pan should fit tight and proper. Many verities brands of pizza sauces available in the market. Make a not that each one tastes differs and that reflects also in the result. A good thick bottomed pan will be great to spread the heat evenly. You may use your tawa also to make this recipe. In the low flame, heat a heavy bottomed pan, add a teaspoon of butter. Place two slices of bread. Flip it on to the other side. 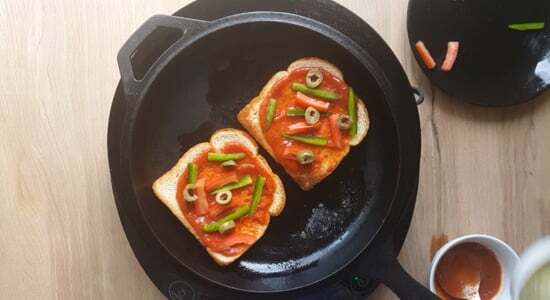 Spread pizza sauce over the bread, and arrange your favorite vegetables. I feel sliced green peppers, olives, tomatoes are perfect. 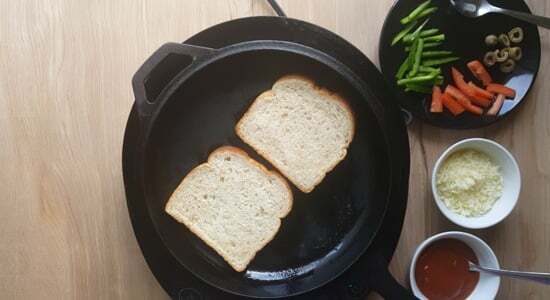 Sprinkle cheese over the bread and close the lid. Wait until cheese melts down. Sprinkle chili flakes and oregano. 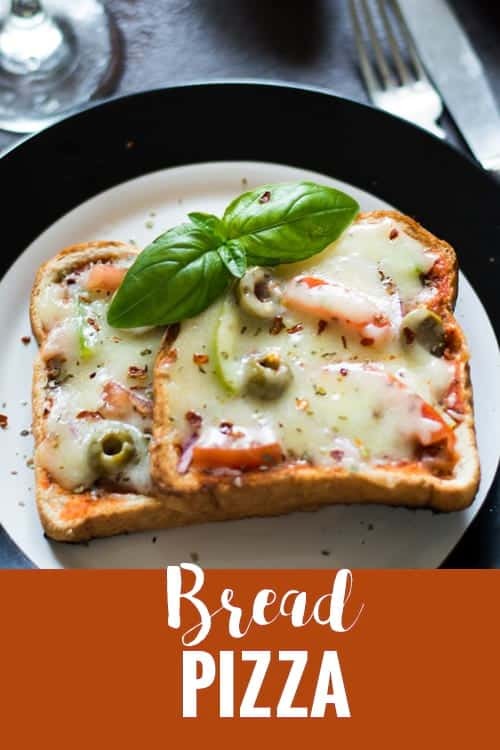 Making Bread pizza without an oven is the simplest of all pizza recipes. This vegetarian Indian style recipe made on tawa/pan. Great to serve for kids. In low to medium flame, heat the pan. Drizzle few drops of cooking oil. Once the bottom of the bread turns golden brown, flip it. 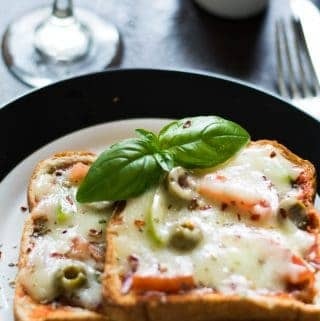 Arrange thinly slices topping of your choice over the sauce. Sprinkle oregano, chili flakes and cover the lid immediately.